57mm Extension for splitters or solenoids. Silver Brass, very strong and durable. 4 x O-rings supplied to ensure good seal. Connect solenoid to regulator or connect splitter to regulator. 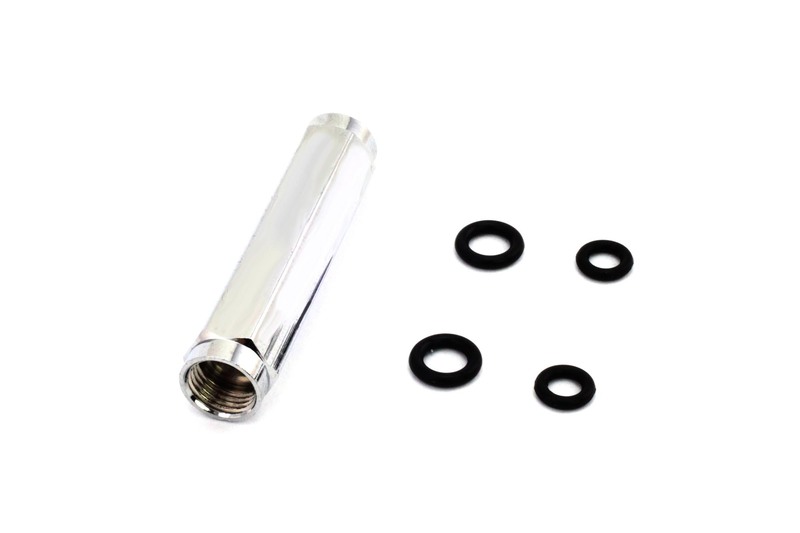 This 57mm extension adapter can be used to connect a solenoid valve to a regulator, or to connect a CO2 splitter to a regulator. An extension is often needed for splitters because the size of the splitter unit and needle valves often mean it impedes on the regulator or pressure gauges. An extension is used to move the splitter away from the regulator components so it is free of any impediment. It is not sufficient to use tubing (even Polyurethane) to connect a solenoid to a regulator because the pressure build-up will cause the tubing to fail (explode). Because this extension is made from metal, it can withstand the pressure and ensure trouble-free use. Great for my reef calcium reactor. Allows me to connect my new solenoid to my old regulator (not bought here). Bought the shorter one first, annoyed as I didnt think of the gauge locations! Great for my reef calcium reactor. Allows me to connect my new solenoid to my old regulator (not bought here). Bought the shorter one first, annoyed as I didnt think of the gauge locations! It did not fit my CO2 splitter. It did not fit my CO2 splitter. If you have bought your brand from us, it will completely fit it. This item was suggested to me as it would solve the problem of fitting a solenoid switch to my co2 system. And it does that. I’m happy. This item was suggested to me as it would solve the problem of fitting a solenoid switch to my co2 system. And it does that. I’m happy. Fits perfectly with 24oz paintball tank and fluval regulator. Fits perfectly with 24oz paintball tank and fluval regulator. Very useful. Thank you a lot!! Very useful. Thank you a lot!! Good quality item that arrived quickly, first time ordering from this company but think on small items like this its absolutely the case that postage could be less. Good quality item that arrived quickly, first time ordering from this company but think on small items like this its absolutely the case that postage could be less. I purchased this extension in order to move my splitter assembly away from the gas regulator on my 5KG FE CO2 cylinder. It made the installtion of the feed tubes to the tank mush easier. I purchased this extension in order to move my splitter assembly away from the gas regulator on my 5KG FE CO2 cylinder. It made the installtion of the feed tubes to the tank mush easier. Highly recommended company and service! Highly recommended company and service!